For our first few nights in Ho Chi Minh City, we stayed at Aries Hotel. This hotel is down a small lane off Nguyen Trai, so it’s a bit hidden, but fairly easy to find. The hotel is fairly new, and the whole hotel, including our room, was exceptionally clean and well looked after. Most staff spoke pretty good English and were very friendly and helpful. Click here to book a room at Aries Hotel. We had booked a standard room but were upgraded to a Superior room. The standard rooms don’t have windows, but the superior rooms do. However, our room faced a wall that was just a few feet away. It still let in lots of light though, and was fine for a stay of a few days. Saigon is the noisiest city I’ve ever visited, so one of the major advantages of this hotel is that it it is very quiet. As it’s set back from the main road, it’s shielded from all the traffic noises. This meant that we slept very well while we we there. 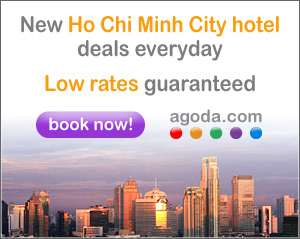 This is a mjor consideration if you’re planning to stay in Saigon. The hotel had free breakfast, which was available from 7-9 am. It consisted of tea, coffee, fruit and toast, plus a few cooked options. It’s a fairly small selection compared to other hotels that we stayed at in Vietnam. One disappointment was that the hotel room had a kettle and cups, not no free tea or coffee.